This post features a photo of the little stuffed fella my son gave me years ago. 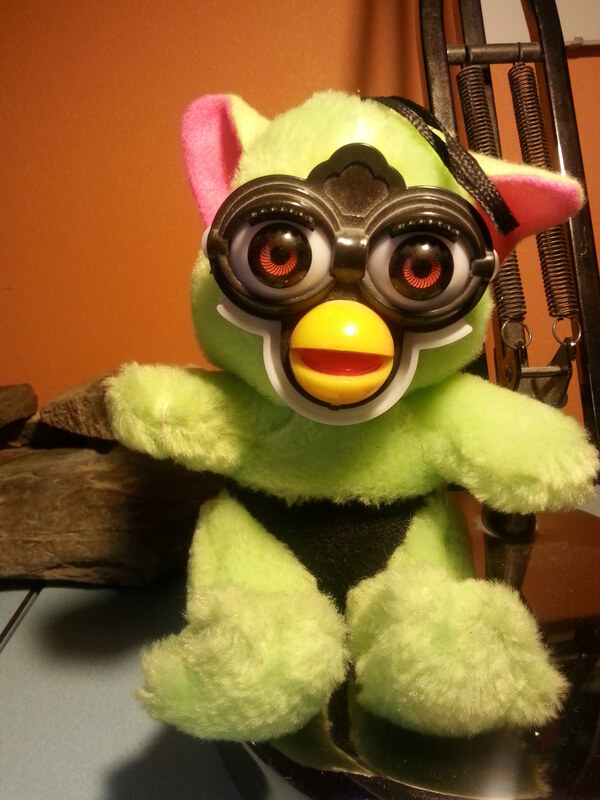 I call it my Writing Gremlin (not really; I just made that up right now), and it sits on my desklamp. That is all. I recently read a post by Jen Williams about her editing process. I commented that reading it made me realize something: when it comes to editing, I’m impatient and lazy. She requested I write a post detailing my editing process, because she’s nosy. It’s been a long time since I’ve blogged, because when I’m writing a novel, I can write nothing else. But—yay, me—I’ve just finished my second novel, so I have no excuse. Also, her post features a picture of a ceramic dog that has nothing to do with editing. Perhaps that inspired me to include the photo of the Writing Gremlin. Maybe I’ll name it Harold. Writing novels exhausts me. And because I’ve never heard writers mention how energized they feel at the end of a project, I figure writing novels exhausts others, too. For me, a draft’s final stages involve shortness of breath, an inability to concentrate on anything other than finishing the novel (including family members, day job, and episodes of Daredevil), and a mental tape loop at the back of my head saying, “I can’t keep this up. I can’t keep this up.” Sometimes, that loop expresses itself via my own vocal chords out of my own big mouth. So when I finish, I’m done. I don’t write anymore. Standard procedure on editing runs like this: Finish draft. Put draft away. Come back 4 – 6 weeks later, sit down and re-read draft, alpha to omega. Fix what re-read shows needs fixing. Send to beta-readers. Wait another 4 – 6 weeks for them to get back to you. Incorporate points consistent across your beta feedback or not, as you see fit. Spellcheck. Only at this point is it okay to imagine the novel might be done enough to send to editors, agents, sympathetic family members, Writing Gremlins named Harold (Harold? Really? ), etc. As mentioned, I’m lazy and very impatient. So impatient that I find planning a novel to be physically impossible. (I know some authors who make spreadsheets. Spreadsheets.) I just start writing, and force the thing along, intuiting what I can of the story trying to unfurl itself onto the page through my clumsy words. Usually this draft is abandoned about 75% of the way through, the point at which events must coalesce into an ending. The second draft is then spent in search of that elusive ending. So, back to an empty page. This time, I had enough raw material to afford some planning. This led to a re-imagining of the ending that would keep things in the here-and-now and away from the Place-Which-Shall-Never-Be-Written-About. I ended up with a workable story. But I’m exhausted, and it’s not the kind of exhausted that will be remedied by taking a month away from the draft to let it cool. This exhaustion will only be remedied by getting the text off my mind, which entails sending it away, attached to an email. So I do not let it sit for 4 – 6 weeks. I start editing right away. (Actually, this time, I took a three-day break and drank too many martinis, but that’s beside the point.) My reasoning is that 4 – 6 weeks have passed since I’ve written the first act, so it has cooled enough. And by the time I reach the end, the thought of finishing will be sufficient to steamroller me through. The process itself was to reduce 130K words to under 100K. I did this a chapter at a time. I opened the previous draft. For each chapter of the new draft, I opened a new document. Into this I pasted the old chapter, paragraph by paragraph. If a chapter was, say, 3700 words, the goal was to get the new chapter below 3K. A 250-word paragraph had to come in under 200. Sometimes this was easy; the amount of crap I write at each chapter’s start, just to get to the good bits, can get chopped. Sometimes, though, the process involved cutting entire sections from the middle and figuring out ways to incorporate the remains into the next chapter along, and so on. Those were the headachy times where I reached for caffeine, sugar, or those other things which for several reason we won’t mention (to quote Rufus Wainwright). This consumed every spare second of every day, paragraph by paragraph, including weekends, where twelve-hour days were the norm—not because I was inspired or possessed of some uber-enviable work-ethic, but because I’m impatient and lazy. I knew stopping for 4 – 6 weeks would make finding the energy to get myself going again impossible. I wanted the thing done and sent off (and thus off my mind). This lasted 3 – 4 weeks. I ended up with 105K words. Inevitably, there will come more editing. A spellcheck doesn’t catch when you typed ‘once’ instead of ‘one’, for example. Awkward sentences, yeah, I wrote a lot of those and didn’t catch every single one. Ideas have since occurred that will improve certain scenes. But, for now, I’ve sent the novel off. So I will wait to do these next tasks. Probably about 4 – 6 weeks. And that, at least for the most recent novel, is my editing process. I only use that for novels, though. For blogs, I’m too impatient and lazy to do anything other than write, spellcheck, and post. Maybe the Writing Gremlin’s name is Prosecco. Or maybe something other than writing is on my mind. I always thought writers had to publish two or three novels before they delivered a masterpiece. Song of Solomon was Toni Morrison’s 3rd, Beloved her 5th. It took Cormac McCarthy four previous novels before he wrote Blood Meridian. Debate all you want about your favorite Stephen King novel; for me, he became a big hitter with The Shining, his 3rd. Every once in a while, though, a novelist starts big. Real big. Think Emily Bronte. Harper Lee. Think Donna Tartt. With The Miniaturist, Jessie Burton falls into this latter category. She’s delivered a major work on her first try. And, unlike Bronte and Lee, I suspect she’ll deliver many more. The novel starts with a haunting prologue detailing a mysterious funeral that occurs shortly after the conclusion of the novel’s main events, leaving us to puzzle at the identity of the deceased as we read the succeeding chapters. The story proper, though, begins in 1686 with the arrival of 18-year-old Petronella Oortman (Nella) to her new home in Amsterdam. Innocent of the city’s ways, she has been married off to an older, wealthy merchant named Johannes Brandt. We witness events only through Nella’s eyes as she tries to negotiate the undercurrents of this strange, and rather spooky, household. Her husband is rarely around, sleeps in a separate bedroom, and though affectionate and caring, remains distant. His black-clad brooding sister, Marin, dominates affairs when Johannes is absent, and often when he is home. The servants seem to know more than Nella knows, but aren’t telling. Feet fall softly in the hallways at night, incoherent mumblings meander through the passages, and doors quietly open and close. Then Nella receives her wedding gift—a large wooden cabinet containing an exact, though miniature, replica of the Brandt household. To furnish it, she contracts the services of the novel’s title character. Though we only catch glimpses of the enigmatic Miniaturist (Nella sends letters, and receives packages in return), the items that begin to fill up the cabinet show nothing but the most exquisite craftsmanship; items of furniture, for instance, that are precise copies of those in the Brandt house down to the most minute details. 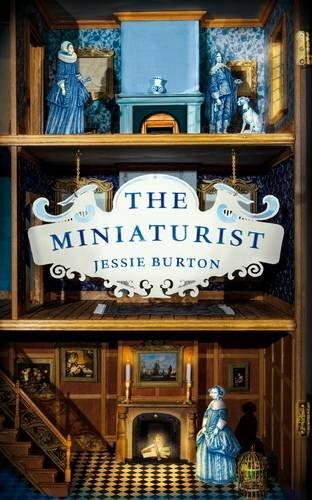 But, even more eerie, the Miniaturist begins to send Nella, unrequested, little wooden figurines of the house’s occupants that display an uncomfortable familiarity with their personal lives. Frightened and intrigued, Nella tries to pursue the Miniaturist in the hopes of uncovering the secrets that surround her. Bit by bit, she discovers just how much danger she faces. Told in strikingly vivid prose that engages all our senses, we are immersed in the world Burton has evoked. We see and smell 17th Century Amsterdam, we feel the damp cold of the Brandt house as winter closes in and the days grow dark. And we travel the twisting pathways of Nella’s thoughts—confused, lonely, frightened, increasingly courageous, and always delightful—as she unknots the mysteries that bind the Brandts. The Miniaturist satisfies like only the best of literature can. Bravo.